← Wines for your Late-Summer Barbecue & Just In: Whispering Angel Magnums! In Napa Valley, Cabernet is king – and we have selected some of our very best for this sale! Sale Price $169.99“Exhibits a delicious, up-front core of juicy dark berry, blackberry, black licorice and creamy, toasty, vanilla-scented oak. Appropriately tannic and structured, this is made in a style you can drink now or cellar for up to a decade. Drink now through 2026.”Just released! This is the “Special Selection” bottling, following on the heels of the regular 2012 Caymus Napa Valley bottling which (while celebrating the winery’s 40th anniversary) was one of the the most popular wine we’ve sold in 2015. We are awaiting reviews and scores on the wine, but given the quality of the 2012 vintage in Napa, and the fact that the regular bottling received 96 points from Robert Parker, it’s a safe bet to assume this is going to be incredibly well received by the press. Please note that due to bottle length, this wine will need to be shipped in styrofoam packaging. Robert Parker’s Wine Advocate 99 pointsFlirting with perfection, the 2012 Dominus is composed of 93% Cabernet Sauvignon, 5% Petit Verdot and 2% Cabernet Franc. Five thousand cases were produced, a relatively modest amount from this large vineyardâ€™s big crop. Christian Moueix told me that there was plenty of heat in 2012, but there were no excessive hot spells that can plague Napa Valley vintners during the growing season and harvest. This wineâ€™s opaque plum/purple color is accompanied by a beautiful nose of sweet crÃ¨me de cassis, a touch of background oak (only 40% new oak is used), spice box, cedarwood, black cherries and a hint of spring flowers. The complex, intense aromatics are followed by a deep, opulent, multidimensional, full-bodied wine with not a hard edge to be found. Everything is seamlessly crafted in this beauty and the vintageâ€™s abundant richness is well-displayed. This 2012 can be drunk in its exuberant youthfulness or cellared for another 20-25 years. The California outpost of Pomerol and St.-Emilionâ€™s famed proprietor, Christian Moueix has been working at this iconic vineyard, Yountvilleâ€™s Napanook, for over twenty years. Many decades ago this was the origin of some of the great Inglenook Cabernet Sauvignons. The 2012 and 2013 vintages were two of the greatest for Christian Moueix at Dominus in his long and distinguished career. Think of these as more modern day versions of the 1991 and 1994, two extraordinary early vintages at Dominus. Christian Moueix considers 2013 to be the greatest vintage of his illustrious career. 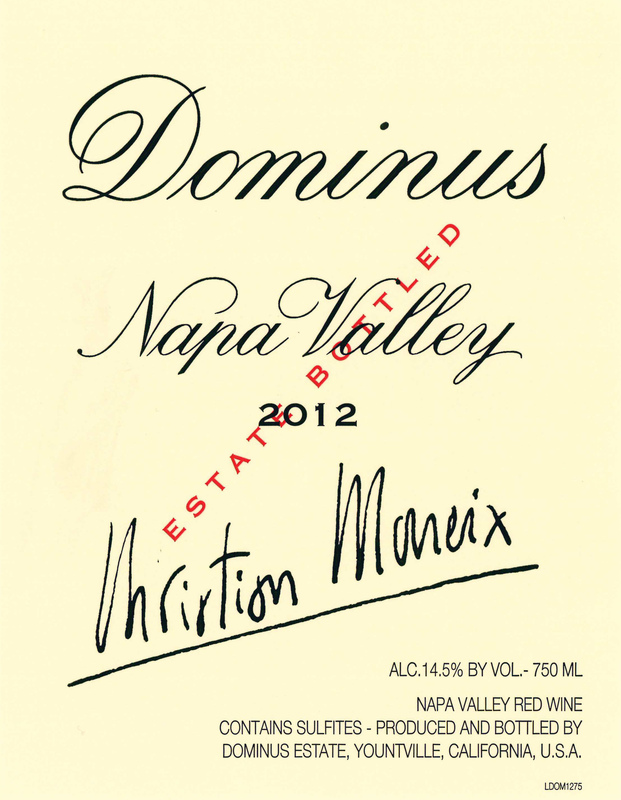 Production was tiny for this estate, with only 2,000 cases of the 2013 Napanook produced and 3,500 cases of Dominus. The harvest was extremely early, beginning on September 10 and finishing on September 26. Analytically, the 2013s have the highest levels of extract and tannins ever measured at this estate. Fermentations were easy, and lasted three weeks.